Thanksgiving morning, I woke up in my childhood bedroom to the aroma of turkey and other delectable delights cooking in the kitchen. I could hear the clanging of pots and pans and the chatter of our older kids having their breakfast. Our family of six had driven seven hours to spend Thanksgiving with our extended family. Normally, spending time with them is one of the most relaxing times of the year for me. There’s nothing quite like going home and having your mom cook for you! But instead of enjoying the peace and serenity, my mind began thinking of all the tasks that needed to be accomplished in the next few weeks until Christmas. There was shopping to be done (or begun), a tree to get, a house to decorate, food to be prepared for Christmas parties, cards to be mailed out, cookies to be baked, teacher gifts to be bought, a house to be prepared for extended family to stay, writing goals to stay on track with, Christmas traditions the kids were expecting; and a final Bible study to prepare. Anxiety crept in as I tried to figure out a mental calendar of what needed to be done when. The most wonderful time of the year can often become the most stressful time of the year. Yet I wonder if the long lines at the stores and pushing ourselves to exhaustion is how God would want us to celebrate the birth of His Son? In the midst of the Christmas craziness, we can often forget the very reason we’re buying gifts and celebrating with family. So I resolved that this Christmas season I am going to war! I’m battling the pull to drown in Christmas chaos and seeking to keep Christ at the center. But please don’t think I’ve got this down and am doing it perfectly. This is a battle, a struggle against the desire for everything to be perfect for my family and guests and instead choosing something better. You might be familiar with two sisters from Scripture, Martha and Mary. They had the privilege of hosting the most important guest you could ever have in your home, Jesus Christ. Can you imagine the pressure they might have felt to have the very best food, use their finest dishes, have everything absolutely perfect? If Pinterest were around, Martha would have been looking up all the best ways to decorate her house and set her table. Yet the two sisters chose two different ways to serve their Lord. Martha was busy getting the physical preparations ready for their dinner, which was important. But Mary, we’re told, chose the better part. Mary chose to sit at Jesus’ feet and listen to His teaching. Now as they went on their way, Jesus entered a village. And a woman named Martha welcomed him into her house. And she had a sister called Mary, who sat at the Lord’s feet and listened to his teaching. But Martha was distracted with much serving. And she went up to him and said, “Lord, do you not care that my sister has left me to serve alone? Tell her then to help me.” But the Lord answered her, “Martha, Martha, you are anxious and troubled about many things, but one thing is necessary. Mary has chosen the good portion, which will not be taken away from her” (Luke 10:38–42). Can you relate to Martha and her frantic preparations? I know when I’m having guests over it’s so easy to become consumed with the preparations that I lose sight of the purpose. They were about to enjoy dinner and conversation with the Lord of the universe! But Martha had become distracted with her serving. And not only that, she became indignant that her sister Mary wasn’t helping, even asking Jesus to command Mary to help her. It can be easy when we’re busy serving to look at others around us who seem to be slacking off. Why aren’t they volunteering for this ministry? Why aren’t they offering to help me more? Can’t they see I’m stressed? I can be really good at creating an agenda in my mind for somebody else. I think I know how they should be using their time! Mary chose the good portion. And what was Mary doing? She was sitting at the Lord’s feet listening to His teaching. She was spending time with Jesus. She was worshiping Him. Don’t get caught in the mindset that God wants you to be living in the holiday frenzy of serving in a hundred different ways but all the while letting your heart grow cold and indifferent toward Him. It’s true that He has created good works for us to do, but we need to be wise and discerning about what those good works are. We need to be careful not to lose the focus of Christ, and the heart of Christ, in the midst of Christmas craziness. Here are five simple ways to help you battle the pull to drown in busyness this season and keep your focus on Christ, seeking to follow His pattern of love and humility. Make time in the Word a priority. Before you run out to get the next best gift, consider whether you’ve opened the gift of God’s Word. Just like any good relationship, our relationship with God takes time and effort. Creating space to open your Bible and soak in the truths of God’s Word will calm your anxious heart and give perspective to life. Reading through a gospel during Advent is a great way to focus on the life of Christ. Carve out time to sit at the Lord’s feet, even if it means missing the doorbuster sales of the day. It’s well worth the sacrifice of your time. Invest time in prayer. Just as we open the truth of God’s Word for guidance in life, God is eager to hear our cries to Him for mercy, truth, and wisdom. 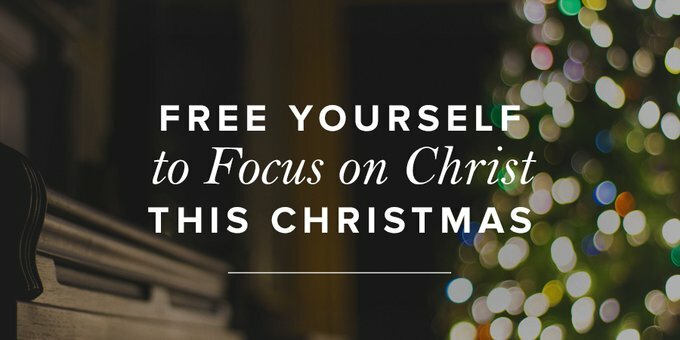 Ask Him to help you keep a Christ-centered focus this season. Repent of days when you’ve been too busy with cookies and kids to spend time with Him. Plead for wisdom of how to make the most of your time (Eph. 5:15–17). Be wise and discerning about your commitments. It’s easy to overload our schedules during the holiday season, even with good things! Ask the Lord for wisdom as to what you should be involved with. And free yourself from the guilt trip of not volunteering for every event. A couple of years ago, I decided that although I enjoy being involved at my kids’ schools, orchestrating the classroom Christmas party just seemed to add one more thing at an already busy time. So now on my volunteer form at the start of the year, I mark that I can help for the Halloween party or Valentine’s party, but I trust that other moms can handle the Christmas party without me. Don’t be a slave to tradition. I love traditions. Our family normally enjoys going downtown each year to look at a beautiful display of gingerbread houses, visit a fun three-story toy store, and see the crèche perched in between the skyscrapers. But if a year comes that it just seems impossible to fit one more thing in the schedule (which might be this year), I need to be okay to let it go. I promise you your kids will survive. Two years ago our family flew to Texas to be with my in-laws over the holidays. Because we were leaving a full week before Christmas, I realized most of our normal traditions wouldn’t be possible. Instead of getting a tree, we put some lighted greenery on our piano. Smaller and simpler presents were bought that could fit inside a suitcase. And there wasn’t time to make my grandma’s shortbread cookie recipe. But you know what? We all had a great Christmas! The simplicity of it freed me to focus on other things that were more important, like worshiping our Lord and time with our family. And the kids never even mentioned missing those traditions. Sometimes we moms put more pressure on ourselves by not letting anything go. Free yourself to focus on Christ. Seek to have contagious excitement about the right things. Our kids will notice whether we are most excited about the latest toy we got on a great sale or whether we’re excited about the Person and story of Jesus. Ask God for a fresh passion as you ponder the miracle of the virgin birth and the incarnation of Christ. Be excited as you read your devotional each night or as you act out the Christmas story on Christmas morning. Although the roles have changed as our kids have grown, each Christmas morning is met with the excitement of deciding who will play the innkeeper, who will play the carols on the piano, and who will ride on the donkey’s back as Mary. The aging donkey (my husband) is getting a workout with each passing year! But I hope and pray these memories of celebrating the birth of Jesus will be with our kids forever. How do you battle the Christmas chaos? What things do you need to let go of in order to keep your focus on Christ? Stacy Reaoch is a pastor's wife, mother of four, and the author of Wilderness Wanderings: Finding Contentment in the Desert Times of Life. When Stacy is not shuttling her kids to various activities and school, she can be found doing women's Bible studies, discipleship, exercising, and eating chocolate. She has contributed articles to Desiring God and The Gospel Coalition. Stacy and her husband, Ben, serve Three Rivers Grace Church in Pittsburgh, Pennsylvania. Are You a Christmas Control Girl?